PT Surveyor Indonesia (Persero) – PTSI is a reputable state-owned independent assurance services company in Indonesia. Its business include Surveying, Verification, Inspection, Certification and Consultancy. PTSI has its business activities focused in 2 business process: Business Process related to Operations and Business Process related to Corporate Policy Establishment. 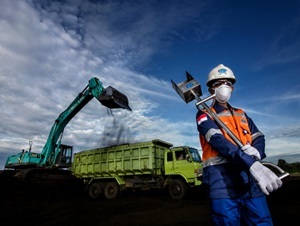 PT Surveyor Indonesia (Persero) is majority owned by the Government of Indonesia. At present, the Government of Indonesia holds 85.12% shares in PTSI. Other remaining shares in PTSI was owned by Societe Generale de Surveillance SA (10.40%), and PT SUCOFINDO (Persero) (4.48%). Domiciled in Jakarta, PTSI conducted business operations in all parts of Indonesia under the management of 11 domestic branch offices, 1 Singapore overseas branch offices, 3 UWK offices, 3 representative offices and directly employs 1,581 employees. PT Surveyor Indonesia (Persero) also supported by 2 key subsidiary companies, namely PT Surveyor Carbon Consulting International (99.00%) and PT Synerga Tata International (60.00%). Education background in Bachelor Degree (S1) in any field. Have a minimum 1 year of experience in the field of marketing. Strong understanding about the services product and other standards which applicable in the Oil and Gas Industry. Have good achievement motivation attitude.